This holiday was planned around celebrating Steve's brother, Clive's, 60th birthday and we were staying long enough to also celebrate Steve's birthday (it needs to be pointed out that Steve is the younger of the two). 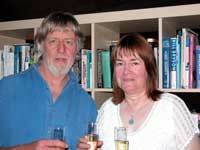 We were joined by Sue and Graham for the first week. We were accompanied on our travels by our good friends Graham and Sue. 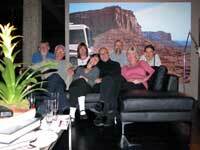 They helped us to clean up Clive's place in readiness for his party. We got covered in dust but as you can see we scrubbed up well enough in time for the big event. Graham had to forsake the beer because the only drinks in the house were sparkling water or champagne. 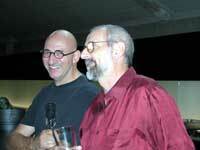 Clive and Stephen at Clive's 60th birthday party. One of Clive's party pleasures was to ask his guests which brother was the eldest and invariably they flattered him by saying he looked younger - hence the big smile on his face. The event started early around 4pm and the music ceased at around 2am. There was valet parking out the front of the building for all guests. This was a prototype of a piece of work Clive was helping with the programming. 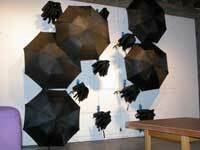 The concept is for the umbrellas to automatically pop open randomly over a set period of time. This was to be displayed in an art show so that a total of 59 umbrellas will open over a period of months but only when the exhibition was open. On the Sunday morning after the big bash we decided to walk from 14th Street to Fisherman's Wharf along Market Street and the up Powell. This took us right past city hall with its magnificent dome. 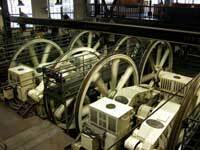 This was not our first visit to the cable car engine house but it is always fascinating. 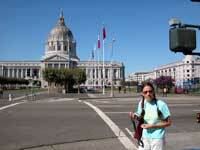 The building was partially destroyed in the earthquake of 1906. It seems probable that another earthquake is due and it is going to see how a modern city copes with such a natural catastrophe. 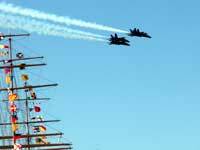 It was Columbus day and there was also an aerial display from the US Navy's Blue Angels. The six aircraft undertook their aerobatic assault with the San Francisco Bay as a back drop. It was very fast and noisy and not that easy to catch with a camera. It seems the fleet was also in judging by the number of ships with flags decorating the waterfront. One of the interesting features of San Francisco is the marine fogs that come rolling into the bay wrapping the Golden Gate Bridge in mist as it does so. The bridge is a marvellous piece of engineering. 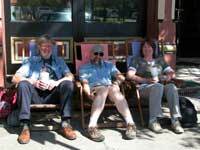 The four of us headed up north across the Golden Gate bridge to a small town called Petaluma. 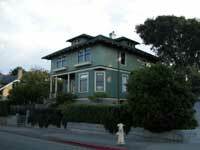 It is an archetypal Californian town dating back a hundred years with some lovely old buildings. Bear in mind this is American "old" and compared to Europe this is a New World. 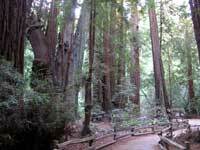 Muir Woods is a large area of Redwoods. Although the day we visited it was quite overcast there were a few breaks in the cloud with shafts of sunlight finding the ground but it is still a dark, cool environment. We had a pleasant hour walking on a relatively short circular walk. 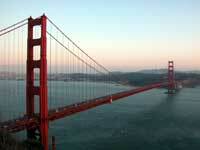 The San Andreas Fault runs along the coast through San Francisco and north up the Napa Valley. 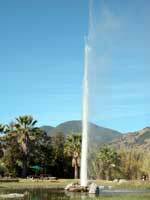 There is significant geothermal activity in some places and this Geyser, called "Old Faithful" due to its regular spouting was worth a visit. it's supposed to be active every 40 minutes but we only had to wait half that time before it started bubbling and then shot into the air. We waited for another event but after an hour walked away only for it to go off again. 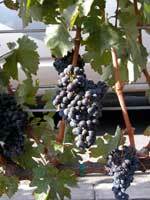 Napa Valley is a significant wine area. We had hoped to stay in some old Railway Wagons which had been converted into beautiful rooms but we were too late and all the rooms had been taken. Instead we stayed in a standard motel just on the outskirts of Napa itself. To prove this is wine country even the car parks have vines growing in them. We did visit a winery but unlike Australia the Americans charge for tasting and for guided tours. The Americans treat their vineyards very commercially and try to make as much money as possible out of them. 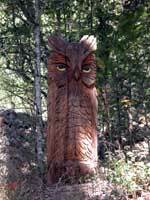 In the woodlands you only need to look around and you will see one of these marvellous carvings from Redwood. This are usually done with a chain saw. This was a particularly good example. Back across the bay but before doing so we drove up to a lookout point and took some pictures before the sun set. 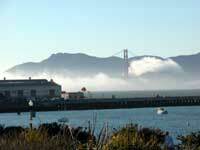 The golden evening sun meant the Golden Gate Bridge lived up to its name. On Clive's actual birthday we went to, by our standards, an expensive restaurant. We had an excellent meal and then all came back to 14th Street and posed in front of one of Clive's first art pieces. 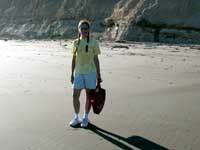 We planned a few days staying in Marjorie's coastal home between Pacific Grove and Monterey. The house was a complete contrast from Clive's home and we really enjoyed the few days we had here exploring the coast. The house is decorated in the Mackintosh style and Marjorie has made an excellent job of the restoration. 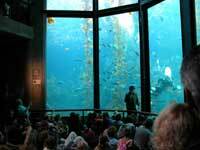 We could not visit Monterey without going to the Aquarium. Here you can see the main exhibit which has kelp (seaweed) growing from seabed to surface. At this moment there was a diver in the tank feeding the fish - a great spectacle. You can also see birds you would normally see on the seashore. They have been injured and restored to health but cannot be returned to the wild. This is us outside the Marjorie's house in Pacific Grove. We had a superb view over the bay and it was wonderful to wake up to this every morning. As you will notice from our clothes it wasn't particularly warm but for October it was warm enough for us. Point Lobos south of Carmel is another wild coastal area and although it costs a few dollars to enter the area it is well worth it. 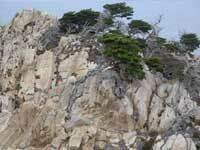 There is a combination of coastal rock and woodland areas. Wherever we stood there were pelicans flying past in various numbers and different formations. It's impossible to resist watching, videoing or photographing them. We took the opportunity to meet up with Martha who we met when she visited us a couple of years ago. We had a delightful lunch talking about what we'd been up to and her latest business venture. 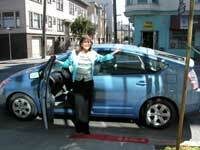 She'd also just taken possession of a new Toyota Prius which is a hybrid, petrol/electric car. She gave us a lift back to 14th Street and it was a fascinating ride. By the second week the weather had cast off its cloak of cloud and the temperatures were in the mid twenties. We were looking forward to a walk along Skyline just west of Saratoga with Clive and his friend Hamdi but Clive was unwell with a cold and ear infection. We drove down in the Porsche to meet up with Hamdi. He usually does this in 85 minutes but we slowed him down because we wanted to stop, smell the flowers (not that there were any) and look at the views out towards the Pacific. On our way back to 14th Street we took the long way round down by Ocean Boulevard which is at the western end of Golden Gate Park. 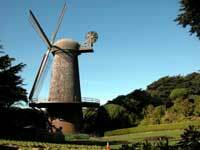 What a surprise to find a windmill in good condition. Within 4 miles of central San Francisco we stood on the beach and watched the surfers. The surf here is not very dramatic but these guys were happy to spend hours trying and trying for the sake of a few minutes riding the waves. The Pacific off San Francisco is not renown for being warm so even with a wet suit on we thought these surfers were very committed. Back at 14th Street we noticed that there were some areas marked out with masking tape to signify where the under floor heating pipes ran. 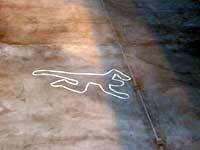 We decided to add a little art work to this and late one night Steve laid down whilst Jane taped around his body. Clive woke the following morning to a piece of our art work. How long he will leave it there is anyone's guess. A postscript to this was that Clive told us that the someone who lived in the premises before committed suicide in the TV room by hanging himself from the sprinkler system. On Steve's birthday we had the Porsche again and we headed North to Point Reyes. We anticipated this would take an hour or so but we were wrong. 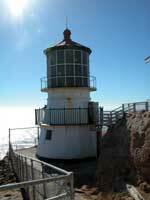 In fact we left late and by the time we rolled up at Point Reyes lighthouse it was 3pm. The last part of the journey was along Sir Frances Drake Drive. To get down to the light we had to walk down steps which we were warned were the equivalent of a 30 storey building - obviously we had to walk back up them. We had a pleasant wander round, watching a number of deer staring back at us. Clive had sent us off with a picnic but by the time we reached Sir Frances Drake beach it was 4pm. We sat on a log delving into this delightful wicker basket, feasting on fruit and other delights. The beach was almost empty but we had the birds for company. It was a perfect day. Driving the Porsche gave Steve a lot of pleasure it would have been even better if the ignition key wasn't so difficult to extract. Another quirk in Clive's cars which we had to get used to. We arrived back later than we really wanted. Clive was ready for us to go out for Steve's birthday meal up in San Rafael - another journey over Golden Gate. After a great evening we were back and had time to sample Steve's cake that Clive had made especially for him. 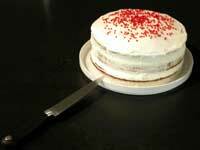 This is Carrot Cake unlike any other and it's ten years since Steve has had one of these. Clive also took some photographs of us before we left with a promise that these would be turned into works of art by Christmas. Jane had a draft version on canvas before we left which she will cherish until the finished work arrives. On the final day Steve was stressed out by the thought of the flight back - it was more about the seating because it appeared we were not sitting together. 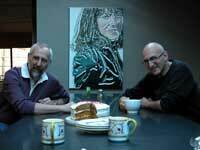 A final picture of the two brothers and Steve's birthday cake before heading off to SFO. The journey back via Detroit was long and tiresome but we arrived safely back at Gatwick and then Steve managed to drive us home without any mishaps. It wasn't until the Monday that jet-lag really hit us and we both attended work like zombies.